Having sold her in May 2011, Michael Nethersole at Northrop & Johnson sends news that he's brought the 31.1m motor yacht Beothuk back to the market. A technological tour de force, Beothuk was built by Kuipers in 2008 and was the first new build yacht to be fitted entirely with LED lights. 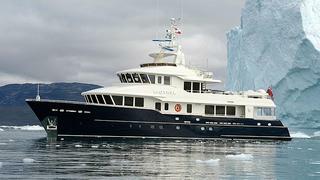 She received a much-deserved Judges Commendation at the 2009 World Superyacht Awards. Vripack were responsible for her exterior styling and interior design and she is packed with facilities and comforts way beyond her size range. One notable feature is her luminous dining area in the forward position on the main deck. Beothuk accommodates six guests in three staterooms: a full-beam master suite, a double and a twin. Twin 600hp Caterpillar engines give her a range of 4,000 nautical miles at 10 knots. Beothuk is asking $11.9 million.